Keep your home neat and clutter free with this large storage cabinet. Made from wood, this cabinet features two doors to the shelf. This spacious shelf is perfect to hold clothes, cutleries, books or any other things that comes in handy. The square top can be used to place vases, photo frames, etc. The stands of this storage cabinet features a curved and arched frame design that adds a stunning appeal. 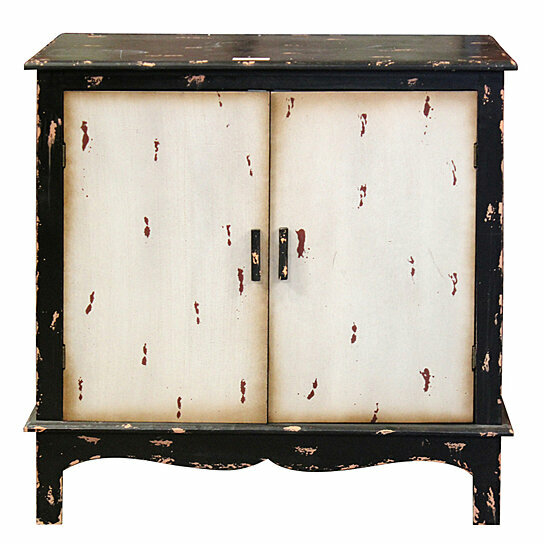 In shades of cream and black with faded peeling effect, this storage cabinet is sure to make a beautiful addition to your home. Your guests will surely appreciate your choice and give you compliments. This storage chest is very durable and long lasting. It can be kept in living area, bedroom or kitchen and takes up less space. It will also be a perfect present. So hurry up and get this storage cabinet now.